Summary: Tess and Lizzie are sisters, sisters as close as can be, who share a secret world filled with selkies, flying horses, and a girl who can transform into a wolf in the middle of the night. But when Lizzie is ready to grow up, Tess clings to their fantasies. 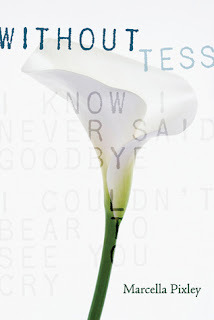 As Tess sinks deeper and deeper into her delusions, she decides that she can’t live in the real world any longer and leaves Lizzie and her family forever. Now, years later, Lizzie is in high school and struggling to understand what happened to her sister. With the help of a school psychologist and Tess’s battered journal, Lizzie searches for a way to finally let Tess go. Ooh, this one sounds heartbreaking, but gooood. Eep! I would definitely love to win this one!!! I've really been wanting to read this one. Sounds like another great but heartbreaking YA contemp. This story looks wonderfully bittersweet. I'd love to read this book! It sounds a good book. I love mystery books. I'm adding this to my to-read list. Thank you for the giveaway! Psychological thriller? Sounds really sad, but good. Sounds like my kind of book! !